Michele Carlo grew up a red-headed, freckele-faced Latina girl in an Irish-Italian neighborhood in the Bronx, looking different enough to place her firmly outside both communities. Now, a writer, performer, and consummate storyteller, her latest book, Fish Out of Agua: My Life on Neither Side of the (Subway) Tracks, chronicles, with generous doses of humor, her life as a "double outsider". Carlo recounts the rough-and-tumble of the late sixties and seventies and an upbringing steeped in spirits, religion, and hilarious escapades as she grows into the accomplished woman she is today. "You kids are black. You are dark skinned and ugly. . . I'm not always gonna be around to look after you, and no man's gonna come along and offer to take care of you because ain't light skinned. That's why you gotta be able to look after yourselves. And for that you gotta be smart." The saving grace was that Donald Thornton loved his six daughters unconditionally, and with his version of tough love, rigid discipline, and uncompromising demand for excellence, led them all to successful adult lives. Dr. Thornton went on to become the first African-American Board certified physician in maternal-fetal medicine all the while raising a family and breaking down racial and sexist barriers. In her second book, Something to Prove: A Daughter's Journey to Fulfill a Father's Legacy”, Dr. Thornton reveals her methods for doing it all while having it all. Click to visit her Web site for excerpts from her books and a schedule of her speaking engagements. 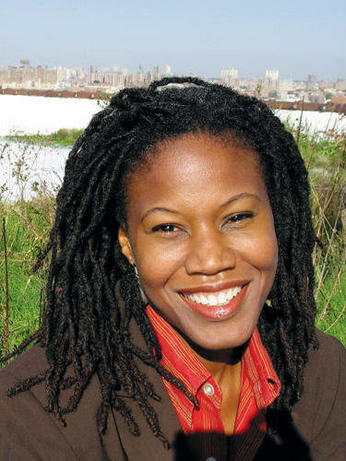 In 2005 Majora Carter was named Fellow of the John D. and Catherine MacArthur Foundation, commonly known as the "genius award", but this was only one of the many awards she has received for her decades-long commitment to environental justice in her native South Bronx, neighborhood, and the world. Founder and CEO of the Majora Carter Group, a consulting firm that "offers pioneering solutions to concentrated environmental problems that are grounded in a progressive economic development approach," she also hosts a radio program, The Promised Land, that takes her around the United States and the world in search of communities in which "extraordinary yet everyday people . . . reveal their dreams and struggles — what inspires and challenges their work and their lives" as they work to better their environmentally challenged and often neglected communities. In an interview with Ojibwe activist, Winona LaDuke, Carter discusses the irony that Native Americans are among the poorest in the population in a land rich in resources. Winona LaDuke is founding director of White Earth Land Recovery Project, a nonprofit organization created in 1989 in order to recover land for the Anishinaabeg (Ojibwe) people. She is also program director of Honor the Earth, a national advocacy group encouraging public support and funding for native environmental groups.